Gym towels bulk 22x44(6Lb/doz) Silver grey bath towels ideal size for sports or workout use. Popular with Gyms, Schools, Universities, Sports centers. Sold in Dozens! Buy more-Save more! When you work in a service business, such as a gym, you find your clients have certain expectations. They like to be catered to, and they enjoy when your amenities go above and beyond what they expect. Offering the right type of bath towel to your clientele can help set your gym apart from the competition. By stocking high-quality, colored towels, you show you think of your clients' unique needs first. They will love having a selection of towels beyond the usual white. We offer silver grey bath towels for gyms and other service businesses such as hotels and spas. Our towels stand out because they are so well made, with high-quality materials and great attention to detail. You can also purchase them for a low cost, part of our wholesale pricing offer that puts them well below retail. The perfect size for your clients to bundle up in after they hop out of a shower, our distinctively colored towels will become a fixture at your gym. Why Purchase Colored Bath Towels From Towel Super Center? Absorbency: Our silver grey bath towels are made from 100 percent cotton. They continue to absorb liquid even after dozens of uses and washes. Size: In a generous size of 22x44, our colored bath towels will cover your clients and allow them to remain modest in your locker rooms. Softness: Bath towels should be soft to the touch, so they don't scrape or irritate the person using them. Our towels pass the softness test, and they won't become course or brittle with repeated washing. Gym owners need to buy bath towels by the dozens. You have to provide towel options for your entire clientele, and that can be hundreds of people. 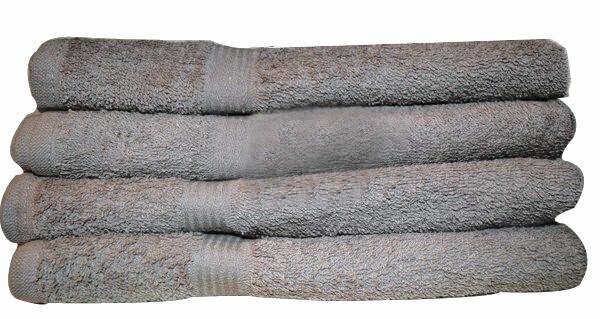 You need a towel of high quality, so as not to frustrate your guests, that also comes at a reasonable price. That's why we sell our towels at wholesale. We allow you to save more when you buy more, discounting the base price when you purchase more than four sets by the dozen. Plus, when you buy in bulk, you only have to pay one rate for shipping, as opposed to paying the shipping costs on small orders over and over. Grey towels give your gym a bit of pizzazz and a lot of happy clients. Stocking up on these towels in your locker rooms will please clients who like to wrap up in big, soft towels after a hard workout. Indulge their desires today. Get in touch with us to find out more about our bulk pricing on silver grey bath towels.